Will latest Hearthstone nerfs resurrect the Control archetype? If you’re a Control deck main, this is good news for you. Since the release of Rastakhan’s Rumble, the Hearthstone team has been hard at work trying to balance the game. 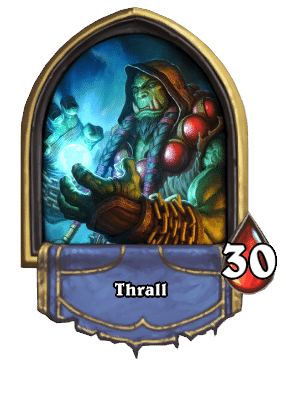 In mid-December the team unleashed a round of card changes aimed at balancing the meta, which resulted in Hunter becoming overpowered. This month, a new round of changes seeks further balance within the meta, taking aim at Paladin, Hunter, and more. If you’re a Control deck main, this is good news for you. 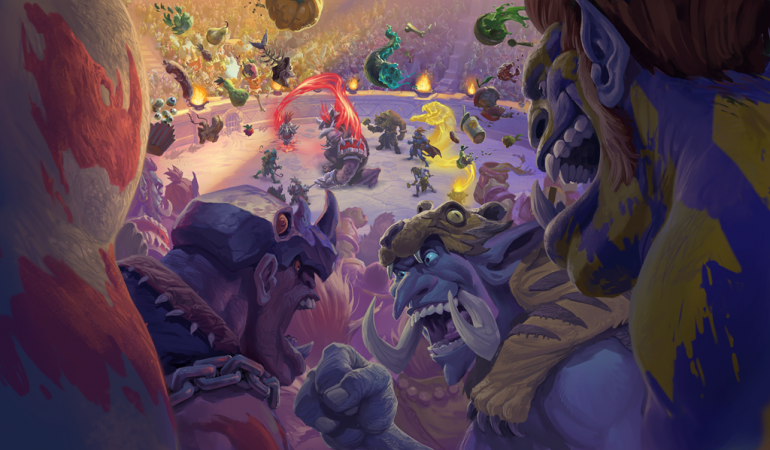 Ask anyone who has been playing Hearthstone since the launch of Rastakhan’s Rumble and they’ll tell you how dominant Hunter and Paladin have been thus far in the expansion. Nearly all of the players who competed on the Hearthstone Championship Tour used a Hunter deck at some point. In that same tournament, with the exception of Priest/Paladin, there was very little play from Control archetypes. Part of the reason Control struggled this meta is due to how dominant aggressive decks like Spell Hunter, Odd/Even Paladin, and Even Shaman have been. With the exception of Priest and its ability to Duskbreaker on turn four, most Control decks didn’t have enough early game board clear to withstand the onslaught. If you did get lucky and board clear, these aggressive decks would set up again increasingly fast. One way Hunter would reset their board was through the use of Lesser Emerald Spellstone. This upgradable spell can summon up to four Wolves that have three attack and three health each. The spell now costs six mana where prior to the nerfs its cost was five. This means decks like Big Spell Mage, Control Lock, and OTK Paladin will have a bigger mana pool by the time Hunter is able to get their Spellstone out to reset. This larger mana pool will leave these classes with more options available to clear, potentially giving the Hunter significantly less value out of their Spellstone. Since Even Paladin and Even Shaman have both had their tempo slowed as well through this series of balance changes, these same Control decks will begin to perform better against them as well. Even Shaman no longer has Flametongue Totem, arguably the most important card for the deck’s necessary early game pressure. Even Paladin had its ability to board clear nerfed through the increased mana cost of Equality. This means it will be much easier to trade with Even Paladin early on because they won’t be able to wipe your board as fast. While this change also affected decks like Control Paladin and OTK Paladin, they were not nearly as reliant on Equality as Even Paladin. So what decks should we expect to see gaining steam in the meta after this series of changes? Any Control deck that was previously too slow to compete—Big Spell Mage, for example. Big Spell Mage is by far one of the coolest (pun intended) Control decks in the game. Playing the deck is meant to feel like you’ve got your opponent wrapped up in your icy spell, dictating their every move as your life/armor total climbs higher and higher. Big Spell Mage has a plethora of high value minions and high cost board clear cards. While the deck may be incredibly slow, it is super powerful if certain strategies and combos can be realized throughout the match. Big Spell Mage runs two copies of Blizzard, Flamestrike, Dragon’s Breath, and Meteor. This is an extremely high amount of board clear for one deck. Previously this meta, Big Spell Mage struggled to use its board clear effectively because of how fast and easy it was for decks like Spell Hunter to reset. Even though Big Spell Mage was able to eliminate threat after threat, it never really had time to set up any sort of offense against the deck. 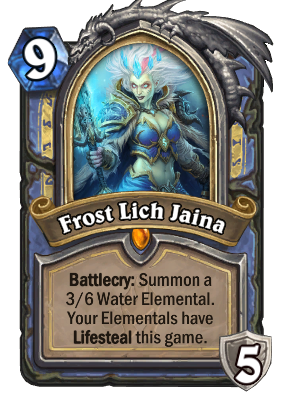 If you didn’t draw the exact right series of taunts and board clear, you were usually dead before you were able to play Jaina. Now that Spell Hunter and Even Shaman have been significantly slowed, Big Spell Mage might actually have a chance at returning to prominence. Another deck to look out for that is in a similar state to that of Big Spell Mage is Control Warlock. This deck has been one of the most popular archetypes since the inception of the game and has also fallen victim to the speed of the current expansion. While many of Control Lock’s board clear is actually pretty low cost with spells like Hellfire and Lesser Amethyst Spellstone, it too was unable to clear fast enough in many cases. 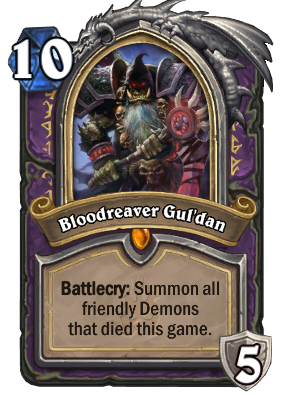 Also keep in mind Hellfire also damages your own minions, so any time a Warlock used their board clear against a fast aggressive board, often times they had to sabotage their own board in exchange. Since Control Lock can’t rebuild anywhere near as fast as an aggro deck, you can see why it would struggle to find footing in the match-up. The slowed rebuild time of Hunter/Shaman will allow Control Lock some much needed breathing room. Warlock players will still need to use their board clear sparingly as they don’t run nearly as much clear as Big Spell Mage, but they will have a significantly better chance at putting up a fight. While things are starting to look up for Control after these changes, the important question to ask is what will this all mean in April? Any change made to the game right now is being made with the upcoming expansion in mind. Many of these changes could just be set up for what’s to come. Since many of the Hero Portrait cards will be rotating out with Knights of the Frozen Throne, we can expect to see something very powerful to surface and fill their role. At any rate, we will just have to wait until April to find out exactly what Blizzard has in store. In the meantime, dust off those old Control decks and see how they feel after this wave of balance changes. You might be pleasantly surprised.